It’s a cool September morning at the Carrboro Farmers’ Market, and Patrick Mateer is busy looking through three boxes of fresh eggplants. Mateer is the volunteer lead coordinator at the market for Farmer Foodshare, a nonprofit organization dedicated to fighting food insecurity in North Carolina. The eggplants from this morning are going to be brought to Abbey Court, an affordable housing complex in Carrboro, said Mateer. But because this is such a large donation, the residents of Abbey Court will not be able to use all of the eggplants while they are fresh. Instead some will have to stored for later, he said. But he said this won’t be the case for much longer. On Aug. 30, Farmer Foodshare received a $450,000 grant from Blue Cross Blue Shield Foundation of North Carolina. With this grant, the organization will be able to invest in infrastructure to improve communication and transportation, among other things, Mateer said. “If we have a ton of eggplant like this week, we can call the Chapel Hill station and they can take half of it and distribute it,” he said. The grant comes only three years after Gifford started Farmer Foodshare at the Carrboro Farmers’ Market. Since then, Farmer Foodshare has expanded to include donation stations at 13 Triangle-area markets and programs like POP Food Markets, where hunger-relief groups are able to purchase food directly from farmers at a discount, and FreshKids!, which provides a weekly supply of locally grown food to agencies that serve children at risk for hunger, said Gifford. Gifford said the grant will be use to create basic infrastructure, like office space, legal and accounting services, staff training and development, improved communication and new materials. The funding will be distributed over a three-year period. The first year will be devoted towards creating sound business practices and analyzing the impact of Farmer Foodshare in the community, said Gifford. The last two years will be devoted to expansion. “We can begin to reach out beyond the Triangle and work with other counties on the issues of hunger and malnutrition and ways communities can address them,” said Gifford. 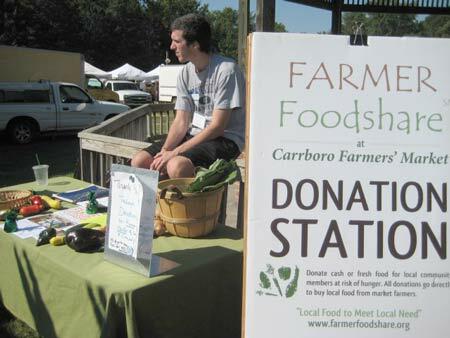 At the local level, the grant will allow Farmer Foodshare to continue to impact the community, said Sarah Blacklin, market manager at the Carrboro Farmers’ Market and a board member of Farmer Foodshare. “I see it adding permanence to our relationship and funding their innovation and development of new projects,” she said. Gifford said that although this is a huge mind shift for the organization, she doesn’t think it will change the core mission.